More innovation in the online real estate business. A team from TotalMove and VacationSpot (acquired by Expedia) have partnered with the General Catalyst’s Joel Cutler, the venture capitalist behind Kayak.com, to create a new twist on real estate search. Roost.com which publicly announced today is enabling consumers to get all the listings in a market from the MLS and use Kayak-like refinement and tool bars to search and sort the listings. They get paid by real estate agents and real estate brokers when a consumer clicks on the link to get more information on a listing. Great UI and smart business model that should be very scalable with relatively low incremental cost. CEO Alex Chang is really smart about the real estate industry and how they are approaching partnerships with the MLS and brokers. What’s Roost’s competitive advantage: NO BS! Roost provides consumers with all the listings and is all about getting consumers to the listings they want as fast as possible. Incredible! Rather than using community and content like Zillow and Trulia to get people to browse to increase pagviews, the Roost model is the opposite – give homebuyers and sellers what they want as fast as possible and try to monetize that relationship. Brilliant! Roost launched today in a number of markets – Seattle, San Francisco and New York were not among the launch markets. They will be challenged from a public perception basis of not being “nationwide”, but that is manageable. Website is a bit slow today, but that could be due to traffic or the fact that they are still working out some of the kinks. Two thumbs up on the whole! Interesting article from John Cook’s Venture Blog today. Zillow entered online real estate in 2005, right before the real estate market started to cool at the end of 2005. The company has grown like mad both from a traffic and headcount perspective. For some reason, Zillow spoke with John Cook today to talk about their hiring plans for 2008 – a move which is very very unusual for a private company. Zillow is reducing their hiring rate adding only 16 new employees in 2008 which is about 10%. 2008 should be a low point for the online real estate industry, so it a smart move for Zillow to reduce hiring (or perhaps even downsize as the other firms in the industry have done). Zillow had great timing in raising another $30m in Sept 2007 from Legg Mason right before the real estate bubble started to lose air. A group of angels and entrepreneurs in Seattle purchased a humor web site for cat lovers earlier this year called ICanHasCheezburger.com Based on Alexa (which I know has its issues), ICanHasCheezburger has more pageviews than Zillow (another Seattle Web 2.0 start-up). Pretty amazing. Those of us who have worked in the online real estate industry are pretty familiar with the seasonality of the traffic patterns. Generally, consumer traffic starts tapering off after school starts in September and then drops dramatically in November and December. But for some reason, right after Christmas and New Year’s Day, traffic starts accelerating. Consumers start searching for homes online about three to six months before they get serious about buying or selling and contacting an agent. Consumers get back to work on January 2nd and are still shaking off the holiday blues by casually surfing and visiting real estate sites. The first quarter of the year really determines what web site is going to be the most useful to both consumers and real estate professionals. Though we are in the worst real estate downturn since the 80’s, consumers came back to real estate in a big way. 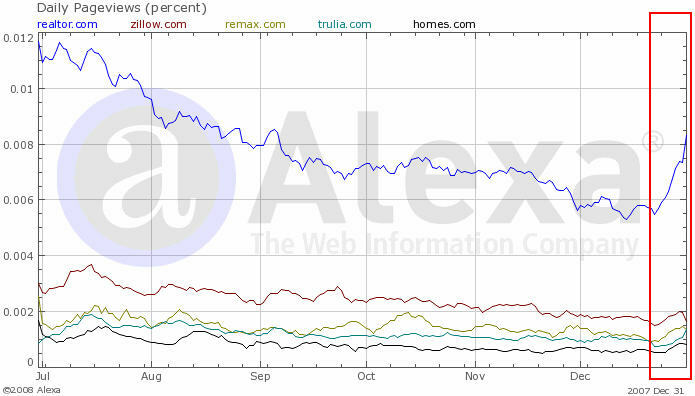 Take a look at the below graphs from Alexa (we need to make the assumption that trends in Alexa are accurate). Nearly every real estate web site experienced a ncie uptick in traffic in the last week. Realtor.com (owned by Move, Inc. and partnered with the National Association of Realtors – NAR) saw the most dramatic gains. VERY SURPRISING. I am not sure why Realtor.com moved so much more than anyone else. I will need to do some research. Anyone have an idea? The below graph is my Tier 2 of online real estate – generally made of companies focused on marketing services, web sites or lead generation for agents. Though it doesn’t show up on the above graph, Homes.com seems to be doing a very nice job in growing their online traffic. Dominion, formerly known as Trader Publications, bought Homes.com in 2002. Homes.com was a survivor of the dotcom boom and bust and was in difficult shape when they were acquired. Since then, traffic has grown nicely. I give Jamie Clymer a lot of credit for his work with Homes.com and Dominion’s real estate businesses. We’ll keep watching the trends over the first quarter of 2008 to see how the online real estate industry plays out in 2008. NAR reports that existing home sales edged up in November. I wonder if this is just seasonal or if we are seeing a bottoming for the real estate market. My gut tells me that we have flushed a lot of speculative buyers and sellers out of the market and that the people who are buying and selling now are the consumers who are truly in market. BUT the true test will be next spring to see if there is a further decline in home sales, since November and December are usually slow months. Year over year, I believe that the 2008 will be slower than the first half of 2007 due to the mortgage mess. Year over year comps for 2009 will probably look good.